Succulent. Spicy. Sweet. Savory. Or more. 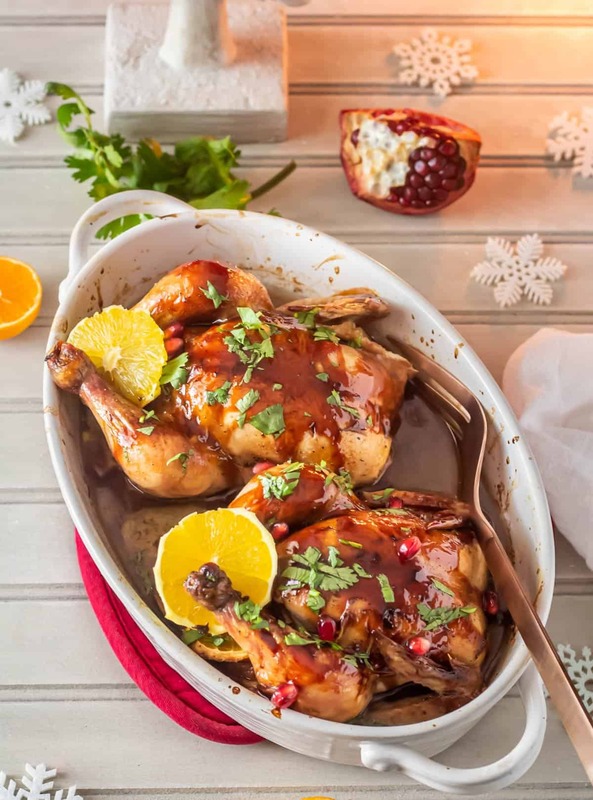 Festive Mexican Cornish Game Hens for Two with Mexican flavors is a lovely main course for two, and easily scaled up for more! Yum. 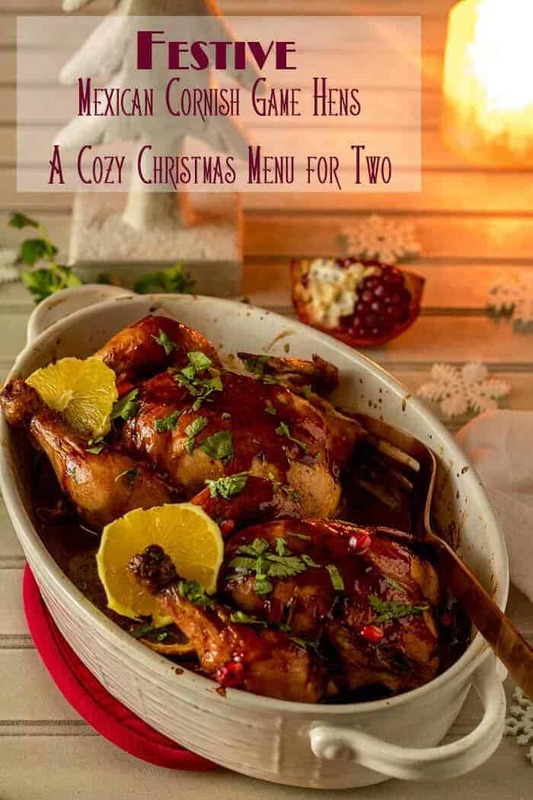 When considering options for a Cozy Christmas for Two in 2017, an option that immediately came to mind was Cornish game hens. I have done them for larger groups – 12 (or so) – in 2013 (I think). But they really are perfect for a romantic dinner for two or a smaller gathering! They cook in about an hour, and can be stuffed and/or glazed in so many different ways. If you saw my last post – Spicy Roasted Orange-Pomegranate Glazed Root Vegetables – you’ve read about how this recipe came to be. We love Latin/Mexican flavors, and I work hard at incorporating those flavors into our diets. The dishes that ensue likely do not meet the definition of “authentic,” but they’re always tasty! Festive Mexican Cornish Game Hens for Two is no exception. My decorating this year was minimal: The tablescape (above), a pre-lit wreath in the entry, and a table top tree… Yes, it’s simple, but it’s festive, and when enjoyed with a beautiful meal and a loved one, it’s perfect! Saturday we fly to Charlotte, North Carolina for 8 days with Nils (oldest), his wife Jamie, little grandsons Cade (3) and Carter (2), our third son Gaelen, and my sister Corinne. I can hardly wait to give smoochies to our littles… We’ll have lots of fun in the kitchen together and clean up many dirty dishes! 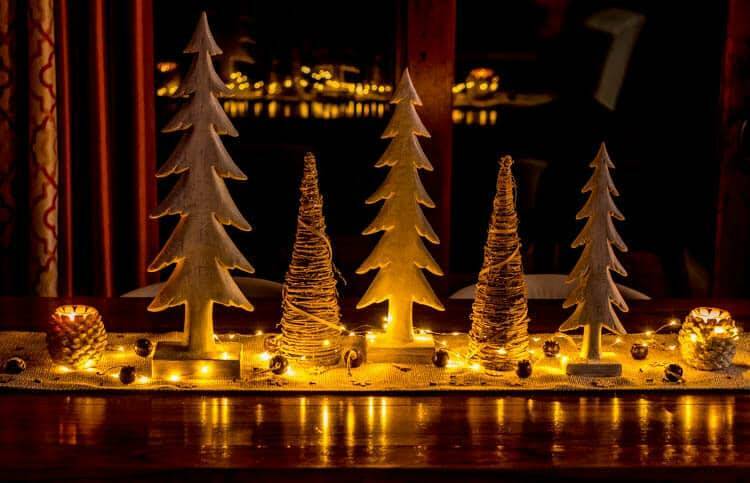 I’d like to take this opportunity to wish you, and your loved ones, a most joyous and peaceful Christmas! Succulent. Spicy. Sweet. Savory. 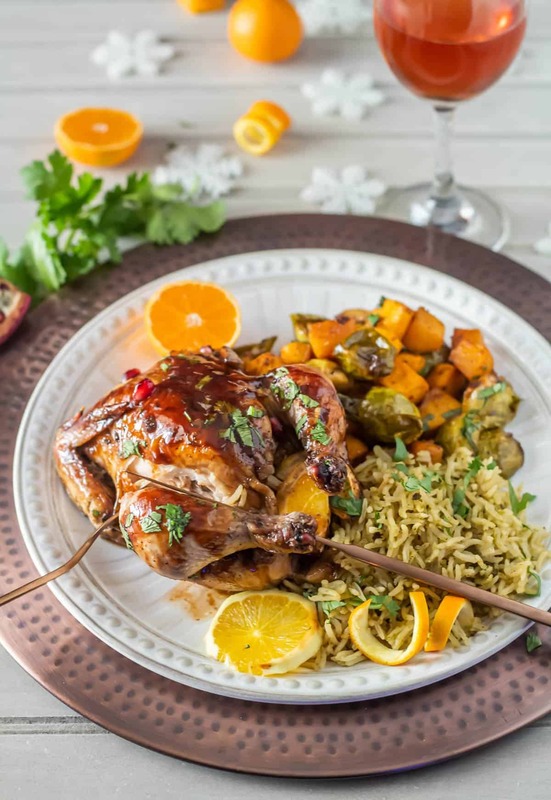 Festive Mexican Cornish Hens for Two is a perfect main course for two, and easily scaled up for more! 2 small Cornish game hens, thoroughly patted dry! Preheat oven to 450 F (425 convection). Make sure your hens are very dry. Stuff 2 cinnamon sticks (use kitchen shears to cut them if necessary), 3 cloves garlic, half the orange slices, and half the onion wedges into the cavity. You may need to push them around a bit. Repeat for the other hen. Brush with melted butter, and season with salt and pepper. Truss the hens by tying the wings and legs with kitchen twine. Place in hot oven. After 15 minutes, reduce heat to 375 F (350 convection). Baste with pan juices and brush with glaze every 8-10 minutes until internal temperature reaches 160 degrees (165 may give you a dry hen). Tent with foil and a towel until ready to plate them. Meanwhile, make the glaze/sauce for your hens. Start by heating the olive oil in a small saucepan over medium-high heat. Add the onion and garlic. Saute until the onion is transparent but not browning. Add the ground cumin. Saute an additional 1-2 minutes. Add the pomegranate juice, Mexican oregano, pomegranate molasses, orange juice and zest, cinnamon sticks, and chipotle in adobo. Bring to a boil, and reduce to a simmer. Simmer 10-15 minutes until slightly reduced (by about 25%). Strain. Rinse the saucepan, and towel dry. Return the strained sauce to the pan. Make a slurry of cornstarch and broth/water. Add to the sauce. Bring to a boil to fully activate the cornstarch. (Mixture should be thickened like a pancake syrup). When the sauce is finished, brush the hens after basting with pan juices - ever 8-10 minutes until ready. Untie the hens, remove aromatics (if desired). Pour the sauce over the hens, and garnish with chopped cilantro, pomegranate arils, and fresh orange slices as desired. I used clementines. I live in the Rio Grande Valley where the citrus is amazing. Use your favorite or what's in season. Pomegranate molasses can be hard to find. Make your own pomegranate molasses. When cooking poultry, I cook to an internal temperature of 160°. I hate dry poultry! If immediately tented with foil and a towel, the internal temperature will continue to rise a few degrees, and the juices will stay in the hen. Calories are very difficult (if not impossible) to calculate on a recipe like this, but the "google gods" want them. The calories vary on how much of the butter sticks to the hen as it roasts, and how much sauce is eaten with it. 2 game hens serves 4 generously. We enjoy leftovers the next day, and save the carcasses for stock! I love game hens, and this is a really great way to fix them.